I remember this distinctly... when I was a kid, I desperately wanted Walkie-Talkies. My neighbor somehow found out, and set me up doing chores around his place so I could earn some scratch and join the wireless communication revolution of the 70s (could a CB radio or shortwave be far behind?). It took forever, but I finally earned enough quarters to get a pair of cool Walkies. I could talk with my friends without having to go in and beg to use the phone! I remember the "serious gear" styling, and the many summer adventures I had, whether I was the Six Million Dollar Man (my value probably rung up around a buck sixty-eight), or Spider-Man. We were spacemen sometimes, but with these amazingly stylish Toshiba Walkies, I think we'd have been from space EVERY time. Among the walkie-talkie cognoscenti, these are a desirable collectible. Made around 1965, these totally tubular transmitters (and receivers... I know, I know...) are all metal, and even have a battery meter to keep tabs on the wallet-draining six AA batts that power the beast. Initially I wondered whether these were intended for kids because they're so well built, but I'm pretty sure that the single channel nature confines these units to backyard adventuring. Though I suppose there could have been a more "advanced" model with more controls... that probably would have required even more batteries. These rarely come up on Ebay, and when they do they command real bucks. A single unit (so you have to find a collector friend with another one) finished last month on Ebay for nearly $150. The accompanying video was part of the auction listing, and gives a great look at the details of this magnificent spaced-out communicator. Really nice voice on the narrator there... he's clearly into his walkie talkies. Though I suppose it would have been more authentic to deliver his lines over a scratchy walkie-talkie transmission, with a few inscrutable morse-code beeps added in for good measure. On January 16th, 2013 we lost André Cassagnes, 86 year old inventor of the Etch-A-Sketch. The Etch-A-Sketch is one of those rare enduring classic toys that has changed little in the decades since its birth, and is just as beloved today as ever. Cassagnes was a French electrical technician. In the late 50s he was installing a new light switch plate, peeled back the protective decal which had attracted some nearby metallic powder thanks to the natural electrostatic charge of the plastic. He made some marks on the clear plastic, and noticed that they became visible through the reverse side. it took some years to transform the idea into a toy, which he then sold to Ohio Art in 1959 for $25,000. For most of its life, Etch-A-Sketch stood steadfastly by its original iconic design. Originally mimicking an early television (in those early days of TV, lots of products made a point of resembling a television set), the red frame and white knobs remained a staple of good toy design - and good package design. Long before every toy boasted an appealing "try me" button, Etch-A-Sketch invited young fingers to play. Toy shelves transformed into impromptu art galleries of all of the pre-sale attempts at Etch-A-Sketch masterpieces. While the standard Etch-A-Sketch is still sold in stores today, there have been a number of variants over the years. Different colored screens, glittery frames, pocket sized versions, even a 1980s all-electronic version that could save and playback multiple chunky pixel images to create animation. "Serious" artists have scribed astonishingly detailed (and elaborately pre-planned, I'd guess...) pictures with the humble toy. Once completed, artists often drill a hole in the bottom and dump out the aluminum powder to make sure that no one accidentally erases hours of work with a careless shake. Whoops. A comment possibly intended as a bragging point about flexibility came off sounding like the candidate had no actual political agenda. Both sides of the aisle were in rare agreement that this quote was a spectacular goof. The winner was, of course Etch-A-Sketch, who saw sales rise by 30% (including a new blue-framed model for ardent Democrats). Ohio Art, manufacturer of the Etch-A-Sketch, miraculously kept the manufacture of the classic toy in the USA until 2000. Just three years later, Etch-A-Sketch was named in 2003 as one of the 100 best toys of the 20th century - a tremendous legacy by any measure. So let's honor André Cassagnes' brilliant invention by giving our Etch-A-Sketches a good shake, and then we can all spend the rest of the day trying to draw a circle. Stylophone S2 - Worthy To Inherit The Throne Of The Original Plastic Classic? We're fans of the Stylophone, an oddball British instrument from the 60s. it strikes a dear bleepy chord within many hearts since for many it was their first ever electronic instrument, or even their first musical instrument! Monophonic, buzzy, and played with a little plastic stylus seems like an unlikely combination of ideas to become a cherished object, but for decades the Stylophone has stood the test of time by remaining resolutely true to its 60s origins. A few years ago the Stylophone re-entered production by the same outfit who put out the original. they added such luxuries as a volume control and an output jack, but it was the same analog bleepiness as ever. More recently, the Stylophone Beatbox morphed the shape into a circle, and triggered a whole mess of samples, and even had a sequencer of sorts built in. We had the first Stylophone Beatbox in the USA, and have since wondered what was next for the proto analog synth. Now we know. The NAMM show rolled out the newest member of the Stylophone family, the S2. it's a larger road-worth successor to the original Stylophone, with some surprisingly advanced tweaks built in. The keyboard is much larger and can be played either with stylus or fingertip. The sound is also tweakable and filterable, all built in. You can even patch external sounds through it and apply analog filtering through the S2 itself. There's more to it, but even this short list is an amazing start. The past few years have seen a resurgence in interest in analog synth technology, and the original Stylophone represents one of the simplest and earliest expressions of electronic sound. A huge part of the fun of the original stylophone is how cheap and odd it is. For example, the 60s version didn't have a volume - the manual helpfully suggests that you cup your hand over the built in speaker! This new version seems like it has tremendous potential to combine the oddball likability of the old instrument, with the sorts of new features that a modern synth freak might look for. We'll have to keep our eyes on YouTube for the first squeaky tunes to come out of the thing. Until then, ostensibly famous synth duo "The Bret Domino Trio" have cut a demo song with the S2. It's a Justin Bieber song, so I'm very very sorry. Just do your best to listen solely to the cool Stylophone bits. Worldwide hit TV series M*A*S*H was first broadcast 40 years ago today. The show teetered on cancellation throughout its first season, but then grew into one of the most popular shows on television (like stablemate "All In The Family" which it was often paired with on CBS). The series finale "Goodbye, Farewell, and Amen" 11 years later was the most watched television broadcast at the time, with an audience of 125 million dewey-eyed fans. There are so many lessons to learn from M*A*S*H, a show that somehow balanced heart-wrenching drama and bawdy comedy. One that has always resonated with me isn't so obvious. It's that maybe cancelling a promising idea after 2 episodes isn't always the best policy. If today's network hatchetmen were in power in the 70s, you'd never have seen M*A*S*H beyond the first season. Same with "All In The Family" (which had soft ratings until summer reruns made it a hit). Can you imagine if the only examples we had of 70s TV potential was Three's Company and The Gong Show? Another lesson is that not every TV show is a rich vein of tie-in merchandise. Even M*A*S*H couldn't dodge the shrapnel of a lot of lousy cash-in crap. I don't mind lunchboxes and posters, and the like... but M*A*S*H action figures? What kid is supposed to enjoy these? I guess it's like playing with army men, except the more tragic side of the equation. The figures are of the main cast, with one variant; you can get Klinger in fatigues or in a dress. Tri-Star rolled out these figures in 1982. Klinger had stopped the "bucking for a section 8" drag routine years before, but even so... is this the first action figure depicting a cross-dresser? Back in the early 80s, 20th Century Fox was raiding their licenses to cash in on the video game craze. They made some mighty odd choices. There's Alien, a Pac-Man clone based on an R-rated movie, and there's M*A*S*H - a mash-up (forgive me) of Defender and the classic board game Operation. Oh, and an even more depressing chip-tune rendition of the show's theme song "Suicide is Painless". This came out in 1983, the year that M*A*S*H went off the air, right in the thick of the video game industry crashing. You can suffer through this on either your Atari 2600 or Colecovision. The Rubik's Cube quickly spun beyond being merely a puzzle. It was a huge fad, a phenomenon, and has since grown to become an icon symbolizing the entire 80s. Not too bad for a frustrating little plastic puzzle. Of course other purveyors of plastic puzzles of the time weren't going to be caught twiddling their cubes. In addition to cheap knockoffs of the cube itself, there was a sudden market for other mind benders, and lots of companies vied for a piece of the puzzle. Parker Brother's Drive Ya Nuts puzzle is what enthusiasts call an "edge matching" challenge. You can see that each of the large plastic "nuts" has numbers on it, and the goal is to match these up with neighboring pieces. There's only one solution, and it is terribly frustrating. I dislike puzzles where there's no rational way to build to an answer. All you can do with Drive Ya Nuts is keep trying to find the fit. There's no logical solve to find. I even consulted a mathematician. A child has about as much of a chance solving this time-waster as does an adult. Here's a photo of the puzzle in its solved form (ignore the bright orange mathematician marks). It was less of a brain challenge, and more of a test of patience. I can't say I feel any better seeing it solved than not solved. Here's a link where you can print out your own version and see if it brings you more joy than it did me. There were other Rubik's Cube era puzzles that managed to delight (which we'll examine in future posts), but Drive Ya Nuts still leaves me just scratching my head. Before space patrol issues you a real ray pistol, they may have you practice your "pew pew" gun skills with this cardboard replica. It's got a deadly looking ("deadly" in that it looks like it might not be well insulated against all of that killer voltage") gun printed on both sides as well as a folded over hinge along the top. The surprise comes if you hold the gun slightly open and bring it down quickly. A pocket of paper flaps out quickly with a loud crack. My gun is a little out of comission because it is quite old (clearly my weapon fell through some fissure in time connecting the 50th century and the 1960s), but an intact gun will issue a loud report. While scarcely a replacement for a classic plastic or tinplate ray gun, but as a freebie with a business name printed on it... not too bad. Though labeling it "all mechanical" is a little optimistic. Kids love soda, and kids love dolls. Uh oh... I feel some synergy coming on! Mattel had been chugging out the impossibly proportioned pulchritude of Barbie for nearly ten years by the time Liddle Kiddles hit the scene at your local toy shop in 1966. Though there were several versions throughout the life of the doll line (existing in some fashion or form through 1970) they were always characterized as being very tiny with a massive puzzler perched on top. Kleo here is about 2 1/2 inches tall, but there were versions ranging from 3 1/2 inches to just under 1 inch. The dolls aren't that remarkable. Wait, I take that back - they are remarkably weird looking. Their bodies are made of floppy rubber, so they don't stand on their own; a task that's difficult at best, thanks to the "encephalitic cutie" aesthetic that still pervades (Bratz, I'm looking at you...) . I shouldn't make such a big deal about the proportions - there is a long rich history of this sort of distorted caricature. How Betty Boop ever stood upright with that giant melon of hers I'll never know. For what it's worth, I have the same doubt of Barbie's ability to stand up, but for a different reason(s). Back to Little Kiddles, Mattel had learned a valuable lesson from Barbie; namely the value of offering a giant selection of accessories. Kiddles didn't just come in soda bottles like Kleo. There were Kiddle sized cars, vinyl houses, even tiny UFOs for the alien based characters (which I hate to admit I'd love to find someday). There were a few human sized add-ons too; records, books, even accessories so you could wear your Kiddle like jewelry. Mattel was ready for a big hit, with the Kiddles resisted at every turn. With a novelty vibe firmly established, it's still a little unusual that these dolls come to you in a replica cola bottle. It's not quite the mystery of a ship in a bottle, but it doesn't really fit in with the rest of the toy line. There were many flavors of doll, strawberry, grape (complete with grapes in her hair) and cola like this one. Sadly Mattel hadn't thought to embedding a soda-like stink into the dolls like stinky Strawberry Shortcake years later. There's also no backstory or anything about the dolls having been born in a bottle, or accidentally delivered by a magic soda jerk... No carbonated crib, or other soft drink outfits. Just a novel outcropping of an otherwise not too remarkable line of dolls that fall over. Despite the short life of Liddle Kiddles, there was a pretty big variety - but nothing compared to Mattel's other stablemate Barbie. There just wasn't room for Kiddles in the toy aisle, or your grocery store's soda aisle. Quadrotor Helicopters Perform The Theme From "James Bond"
Just this week, model helicopters have come up twice in my life. My cinematographer buddies all want to mount DSLR cameras onto remote-controlled model helicopters to get fantastic aerial shots on the cheap. The thing is that I happen to know just how expensive a real model chopper is, and that in the R/C world I think there is nothing more difficult to control than a helicopter (especially with an unevenly weighted multi-thousand dollar DSLR payload). In the last few years, toy makers have introduced very lightweight helicopters with dual blades. They don't look as realistic, but the counter-rotation helps steady the little beasties. Another recent development are these multi-rotor platforms that don't try to look like a helicopter at all. They're used for aerial games, and yes for carrying cameras. I've just got to get my hands on one. Not that long ago, one of these quadrotor choppers would have been the province of a James Bond movie. So in way of tribute, here is a squadron of these models performing a unique rendition of 007's theme. mount DSLR cameras onto remote-controlled model helicopters to get fantastic aerial shots on the cheap. carrying cameras. I've just got to get my hands on one. Not that long ago, one of these quadrotor choppers would have been the province of a James Bond movie. So in way of tribute, here is a squadron of these models performing a unique rendition of 007's theme. Daddy Saddle - Humiliate Your Dad, Texas Style! I marvel at all you dads out there. Hacking away at the fierce world that has turned its shoulder against you, making a way for your family, your children. Occasionally you sit back, trying to enjoy the life you've built from freakin' scratch... with that piercing look of intense pride, like Barbara Stanwyck looking out over the back forty. Okay, so I can understand that you dads will do anything for your kids. I also remember rare horsey rides eliciting a "ya-hoo" or two out of this cowpoke. The Daddy Saddle is taking us into a whole weird area, though... Are you dads out there telling me that when Mr. Junior Rodeo asks to saddle you up, making you look even more like the pack animal you already feel like, you say "giddyap, pardner"? Thank goodness Kenner (who also offered a pulse-pounding milkcow action playset) didn't include an oat bag too. Certainly this is such a crazy product, that it could only come from a more innocent past, right? Wrong. There are several companies that manufacture this same product today. One is called the "Daddle" and recommends that you also get knee pads. There's not much more I can add to that. Right, Trigger? These days Lego has a ton of Christmas specialities every year. You can always count on a fresh advent calendar, or even a wintery village. The bricky pickin's haven't always been so good. In fact the overall line of Lego models didn't change all that much years ago. Some models would stick around for a couple years. For example, in 1989, this was pretty much it in the Christmas category. There were a couple of other simple yuletide models back then, but nothing like today's elaborate holiday offerings. You'll also notice that this model is made up of very simple shapes rather than the more detailed (and often less versatile) pieces you get today. There are also none of those pieces consisting of one big chunk that you could have built from smaller bits. Adult Lego fans humorously refer to these single piece abominations as "POOPS": Piece Out Of Other Pieces. Check out how versatile this 20 year old set is thanks to the variety of simple pieces. I like these little Holiday sets as they're terrific stocking stuffers, and fortunately Lego still offers these litte sets for a buck or two. They even offer special limited-edition random minifigs for you collector types out there. Kids love these sets, and don't forget... it's okay for grownups to like Lego too. This may look like a typical TV news clip from 1977 (from Chicago's WGN Channel 9 as it happens). It's a fairly standard TV news theme from around the holidays. First, spook viewers with the possible threats posed by popular toys, then pit the poor reporter against these perilous playthings. In this clip, our hapless correspondent shows us the dangers of a suction cup dart that refuses to stick to its target. Many, many times. Okay, that's kind of funny... but stay tuned past the bloopers to see the outrageous 70's newsroom and the atomic yellow blazers on our three correspondents. If anything, Ron Burgundy went too subtle. Don't touch that dial yet... Channel 9 used to show the local weather in lieu of closing credits. The footage underneath the weather text is test footage of the notorious Shogun Warrior toy. Watch one of the missiles aimed on purpose at the eyes of a goggle wearing kid. These vinyl robots were a massive 2 feet tall - and were massively popular back then. They were super-colorful with wild designs not typical of American robo toys... but the main feature was always the sheer number of projectiles the robot could deploy. The results of tests like the one featured here declared the toy too dangerous to children's eyes and respiratory systems. It's hard to disagree. The Shogun Warrior is, sadly, a mostly forgotten toy of the 70's, the ban of the toy led to its rarity. I'd actually kind of like one now for my shelf as they are so outlandish and huge, but they command real money on Ebay. You may recall that we featured a Shogun styled Stormtrooper limited edition figure a while back. I've since seen it in person, and it's amazing. Hopefully more Shogun styled toys are in the pipeline. Now that we're adults maybe we can just play with our toys responsibly, and avoid ending up on the evening news. Thanks to Fuzzy Memories, the amazing online museum for classic TV fans from Chicago and beyond. In 2005, MP3 players were still an up and coming thing. 512 Megs didn't seem like a ridiculously small storage space, the iPod wasn't yet the only game in town, and we'd come along far enough to have collectioble MP3 players too. One of the first articles I wrote here on Retro Thing was about an unusual MP3 player - one that fit into a Game Boy Color.... but even that one doesn't approach the kitsch value of the the PEZ MP3 player. News of this nostalgic MP3 player seemed to hit every gadget "blog" (also a new-ish idea at the time) back then. It wasn't an official product of the candy company - rather it was the dream of online entrepreneur Patrick Misterovich, who licensed the iconic design from PEZ. The player is the same size as a genuine PEZ dispenser, and the plastic boy head on top a duplicate of one of the first collectible PEZ dispensers back in 1955. When you flip open the head, instead of being greeted by that familiar chalky candy, instead there's a power switch. One side of the player features simple navigation controls (forget any playlists here people - this is just a very basic player), as well as the mini USB player for loading up the built in memory. The headphone jack is in the dispenser's nape, and it's all powered by a single AAA battery. The player was a limited edition of 1200 (though there are conflicting reports, there may be more out there), with the promise of more designs to come. As it turned out, the plastic faced boy model was the only style to ever hit the market (which seems odd - all you'd have to do for future models is change heads, right? ), so this model became a hot collectible. Even when it was new, the player was on the expensive side at $100 for 512 megs of non-expandable memory. Nevertheless, it apparently made Patrick Misterovich an internet millionaire, at least according to one report. These days, your only hope of finding a player is on Ebay where they are quite scarce, and can command over a hundred bucks. Sadly with all that MP3 player technology crammed into the dispenser, there is no room left over for any candy. I wish they'd left room for at least one of the candy bricks,,. just for emergency purposes, you understand. Nintendo Light Telephone - Their Craziest Product Ever? Erik Voskuil writes, "Before Nintendo became a global household name, it already had a rich history producing fun and, in some cases, downright wacky toys and games. The Light Telephone must be one of their most unorthodox ideas to make it into production. The sound picked up by the microphone is coded into the transmitted light, decoded again by the receiving party’s Light Telephone using a solar cell, and played over the headphone. This creates, in effect, a two-way walkie talkie without the use of radio waves." The Nintendo Light Telephone was released in 1971 to capitalize on the walkie talkie and CB radio craze. each 1.3 kg handset included a telescope to allow precise aiming of the light beam at the solar cell receiver on the other handset, although a tripod would be needed at long range. Because it's sensitive to bright sunlight, this is one toy that would work best in the dark. That said, it would have been impossible for a pair of kids to have a clandestine conversation at night with a pair of giant flashlights giving away their every move. The Light Telephone was priced at 9,800 Yen (approximately $27 at the 1971 exchange rate), a hefty price tag that probably limited its popularity. That's a pity, because this has to be one of the craziest, coolest and most collectible Nintendo products ever. Eric from miniorgan.com just gave us a heads up on an auction for a rare Tomy Voice-Corder. Released in 1972, this complicated and pricey toy allowed kids to record one-off dub plates on colorful plastic-covered cards which could be sent to friends and family as 33 RPM audio postcards. The blue recording arm features two needles -- an inner guide needle runs along an inner groove molded into the white center spindle of the platter. The outer needle records your future hit single onto the blank card. 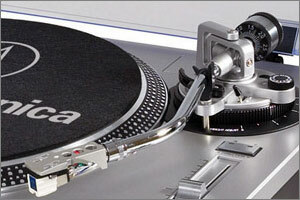 The red tonearm is used for playback, although the records are also compatible with standard turntables. The complete set is currently listed on the Yahoo! Japan auction site. It includes the Voice-Corder with handheld microphone, original box and eight recording cards featuring bewilderingly cute photos of children and animals. Want it? It's yours for the staggering sum of 500,000 Yen -- about $6500.